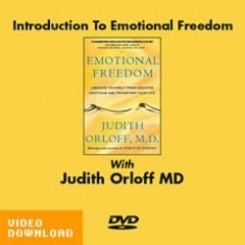 In this video download, Introduction to Emotional Freedom, you will learn that our society is in the midst of an emotional meltdown. People are restless, volatile, their tempers about to blow. A recent Gallup poll reported that motorists are more concerned about road rage than drunk driving. Thirty-five million people have been prescribed Prozac in the last decade. The World Health Organization predicts that twenty years from now, depression will be the second leading cause of death. We deserve relief. 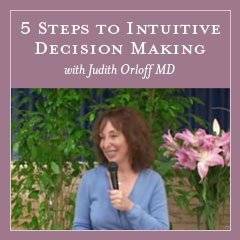 Dr. Orloff presents you with new solutions for dealing with emotions because conventional coping mechanisms just aren’t holding up in our hyper-tense world. It’s madness that we’ve come to tolerate chronic anxiety, fatigue, or depression as normal. Emotional freedom is the answer. It’s the increasing ability to love. Getting there entails cultivating positive emotions and being able to compassionately witness and let go of negative ones. Then you can choose to react in a constructive way. Instead of spinning out with say, anger after you’ve been hurt, you have the capacity to respond from a centered, more empathic place. Emotional freedom includes both personal and spiritual evolvement. In this video, you’ll see how learning to work with negative emotions, rather than collapsing into them, helps you spiritually grow and rise above what is small within you. Becoming free removes counterproductive emotional patterns and helps you view yourself and others through the lens of the heart.